Kim Churchill on his Weight_Falls tour, the most enlightened week of his life, and the best pancakes he’s ever had. Kim Churchill’s new album Weight_Falls is a melting pot of intricate guitar work, honest storytelling and stunning harmonies - so would you believe me if I told you he basically wrote the whole thing in one week? The 26-year-old New South Wales multi-instrumentalist initially spent eighteen months working on the follow-up to his 2014 EP Silence/Win, only to suddenly realise something wasn’t quite right. While he liked all the songs, they felt “too polished” and somewhat dishonest. Thus, overcome with an overwhelming sense of clarity and inspiration, Kim speedily re-crafted Weight_Falls in one week, keeping just three of the songs from the initial album. These unusual time constraints also allowed Kim to discover the joys of GarageBand, marking the first time there has been a heavy digital influence in his songwriting process. Prior to the Perth leg of his Weight_Falls tour this Friday 13 October, Kim gave us some insight into the most enlightened week of his life, his new love of GarageBand, and the best pancakes he’s ever had. Hi Kim, congratulations on the release of Weight_Falls and all its success! You’re about two thirds of the way through the tour now - how has it been going so far? Oh my god, are we? It feels like it just started! We’ve had a wonderful time. It was a big process setting up the whole new live show with these two drummers singing harmonies as well. Getting out on the road and actually doing that every night has been ridiculously fun. Something that makes Weight_Falls particularly impressive is that you basically rewrote the whole thing in one week. In that one week of rewriting, what was your state of mind? Were you stressed at all, or did you just feel completely liberated? The latter! It was wonderful. I’d been - for want of a better phrase - lying to myself for so long about that other material and telling myself it was going to be right in the end, when the truth of the matter was from the get go, I wasn’t entirely happy with the material. But for that week, I knew exactly what I wanted to do and what I needed to do, and I knew exactly the sort of songs that I wanted to be writing, and they just came so easily. I started at 6am the next morning after I made the decision, and the first song was done by about 6.45. It was wonderful; I don’t expect to feel quite that elated many times in my life. Sometimes - what is it? - the dawn comes after the darkest hour? Something like that! You’ve mentioned that only three songs made the cut on the rewrite. Can I ask which songs they were? They were CYGO, Rosemary, and Breakneck Speed. It was an interesting process, because Rosemary was always going to come across. It’s a special song; I just needed to re-record it. CYGO was a very fortunate thing where a friend of mine - Ben from a band called Boo Seeka - wanted to do a remix, and then he remixed it, and I liked the remix but it wasn’t very me. So then I remixed his remix, and that kind of gave it a whole new life! Breakneck Speed was the record label’s request and so I went with that. I spent a bit of time messing around with that. When it was out on its own and then tucked in with the new material, it felt pretty right in there. You’ve said that the underscore in your album title is a nod to you using GarageBand for the first time in the songwriting process. Looking to the future, are you keen to continue using GarageBand, or was it just sort of the only resort you had at the time? Definitely! And not specifically GarageBand, but just allowing technology into the songwriting process. It was really exciting for me because I’d never done it. In the past I really insisted on, “No, this song has to be really great on just an acoustic guitar. If it’s not great there, then I shouldn’t go messing around with the other elements of it.” And then I got GarageBand open and found that it was incredibly inspiring, and then later on I could strip back the songs and find their wonderful acoustic version. So from now on, I think that I’m going to really open myself up to the role technology can play in the songwriting process. What song on the album are you most proud of? I really like Weight Falls, the title track of the album. It’s the first one that I wrote; it’s the one that happened at 6am in the morning, and I just really felt like I hit a certain level of honesty, which is something I really strive for. I feel like there are a lot of things that stop us from being really honest about how we’re feeling - a lot of ego stuff, and society’s stringent expectations and that kind of thing - and that was one moment where I really felt like I was expressing the way I felt very clearly, and that was really nice. So as we’ve already discussed, this is the first tour in which you’re performing with other people - your drummers who also sing with you. What made you decide to bring other people onstage with you for the first time? GarageBand! [Laughs] It all stemmed from that. I was able to all of a sudden start layering harmonies and layering drums, which was something I had messed around with on my earlier album, but really got stuck into this time. I also felt it was time; I’d kind of done the solo one-man band thing for quite a few years, and had been experimenting with how to move up to the ‘having more people onstage’ but doing it in my own way that was kind of unique. I then stumbled across this new sound and felt that it was the exact set of circumstances that were asking for more people, so I went out looking for some rather odd, very multitalented musicians. Did you already know them or did you find them through other people? I thought it probably wouldn’t happen, but I thought I’d go for exactly what I want first, and then start scaling back my expectations when they couldn’t be met. But we found the two players, which was incredible, and they’re really good friends now. They’re such wonderful people to share the stage with each night. Did it take a while to adjust to this new stage dynamic when the tour started or did you settle in quite quickly? I think I’m still getting there to be honest. The shows are really fun. I feel like it’s such a step up from anything I’ve ever done - me learning how to move around the stage a bit more and be more of a frontman, because I’m still doing quite a bit myself (kick drum, snare drum, guitar, harmonica and singing), but there is room for me to move around a bit and rev the crowd up a bit more. And I’m standing; in the past I’ve always been sitting. So I’m still figuring out that sort of stuff, but to be honest, that is a really beautiful, fun part of the journey, being able to start moving and dancing a bit and letting rip a bit. It’s cool. Looking back on the shows you’ve already done, what have been your favourite songs to perform live? Second Hand Car’s been amazing to perform live because everybody knows it, they’re singing along. I think back to that week I spent in my room and putting these songs together, and seeing them come to life like they have and have hundreds and hundreds of people sing it back, that’s quite an incredible thing. So that one’s been really nice to play. Weight Falls has actually been really nice to play; we’re doing this thing with this super old 1930s condenser mic, where we unplug everything and have just two guitars and our three-part harmonies around this old microphone, and that’s been really fun. It’s always a bit of a rollercoaster ride because some of the venues we’re playing are very loud, kind of drunk crowds - not particularly drunk in comparison to a lot of other music, but for the range of performances that I do. We’re doing bigger clubs and it’s kind of crazy when 700 people all shut up and listen to the pure acoustic performance. It’s always terrifying starting because you’re like “Oh my god, is everybody just going to talk over the top of us?” But everybody goes really quiet and starts clicking along; it’s wonderful. Your tour started on 14 September and you’ve been to so many cities. What have been some of the non-performing highlights of your tour? We went bungee jumping in Cairns, that was pretty incredible! They got in touch with us and said “Would you like to do it?” Townsville was just a rad gig - oh, wait, that is performance based. That was a really awesome crowd, very up for it. Melbourne, I had probably the best pancakes of my life. Some place called Top Paddock. I think they’re pretty well-known. That pancake was out of control. Sounds like you’ve had a good tour. I just have one more question for you: who are you listening to at the moment? I’ve been listening to an EP by a group called Sylvan Esso. They brought out this cool EP called Echo Mountain Sessions, which I’ve been really digging… My guilty pleasure is the new Coldplay EP. They’ve had me wrapped around their little finger since I was nine years old and Parachutes came out… A US group called Lewis Del Mar, they’re pretty exciting, they’re kind of America’s alt-J I think, but maybe a bit heavier. And alt-J! The new album I really like as well. So they’re probably my picks at the moment. 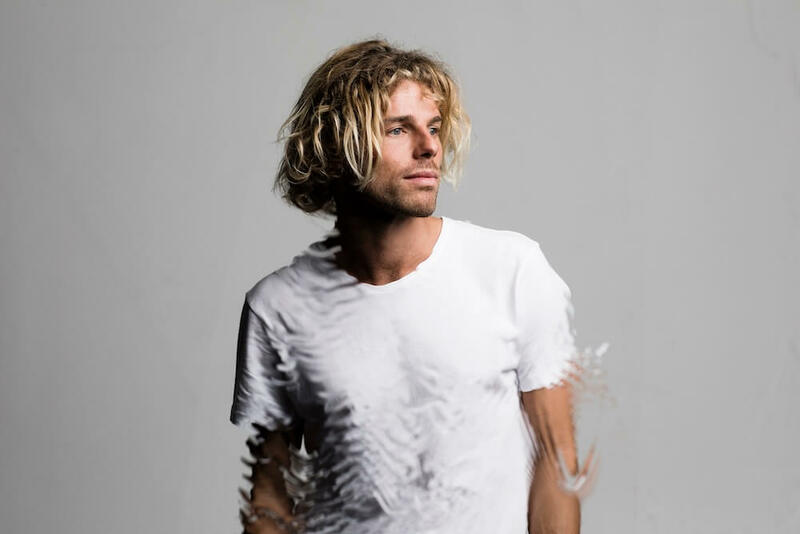 Don’t miss Kim Churchill at Fremantle Arts Centre this Friday 13 October. Get your tickets here.